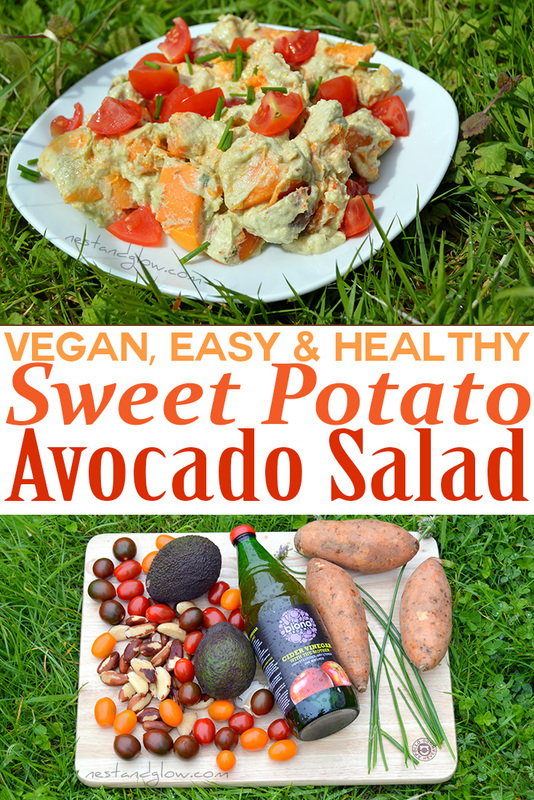 This avocado sweet potato salad is oil free, low GI and vegan. Normal potatoes have been swapped for their nutritionally superior sweet counterparts and unhealthy mayo has been swapped for an avocado and Brazil nut mayo with no added oil. Full of raw unprocessed heart healthy fats from Brazil nuts and avocados. Can be made nut-free by using sunflower seeds instead. The mayonnaise from this recipe is our Avozil Mayo. This is a perfect summer dip and couldn’t be easier to make. All this gives a decadent, healthy and delicious side salad. Perfect for summer BBQs and picnics as can be made before hand and tastes just as good. Like normal potato salad it tastes best chilled. 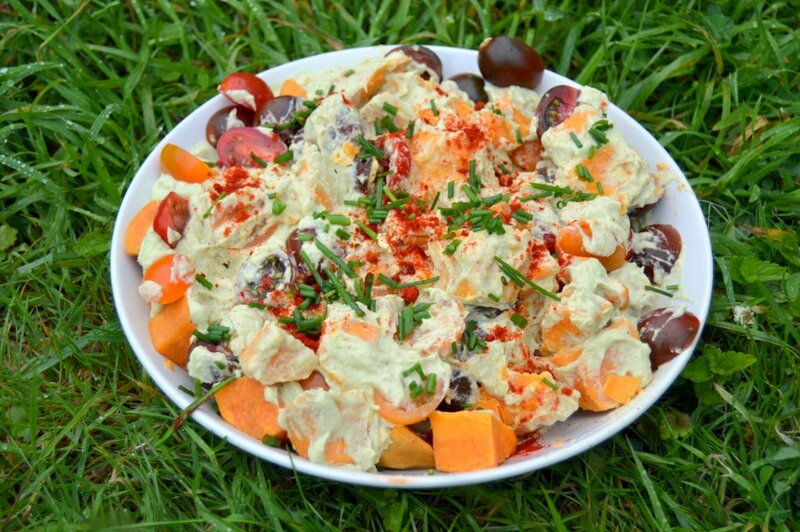 Avocado Sweet Potato Salad with tri colour tomatoes. Don’t worry if you can’t get yellow or black tomatoes red ones are just as good. I top it with cherry tomatoes, chives and smoked paprika but you can swap these out with any other fruit, veg, herbs or spices that you like. Sweet peppers, Cayenne pepper and spring onions also go great on top of this. Sweet potatoes, 1kg / 8 cups pealed and diced. About 2 large, 3 medium or 6 small. Peal and dice the sweet potatoes. Steam sweet potatoes until cooked, about 20-25 mins. Mix together the cooked sweet potatoes and the mayo. Sprinkle on the tomatoes, chives and paprika. Store in the fridge and it will last for about 3 days. If I could find a print button, I would give this top marks. Since I couldn’t, it is a total loss for me.